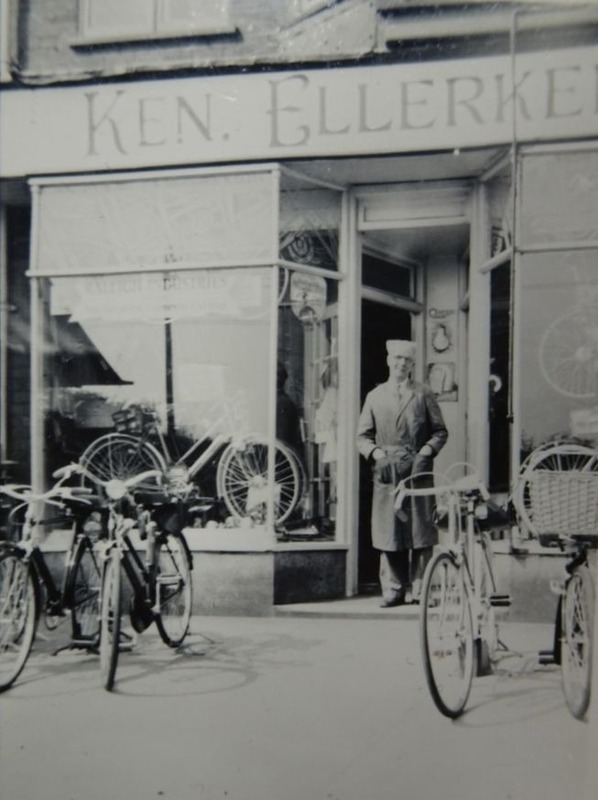 Ken Ellerker Cycles is dedicated to the excellence of service that can only be found at a real bike shop. 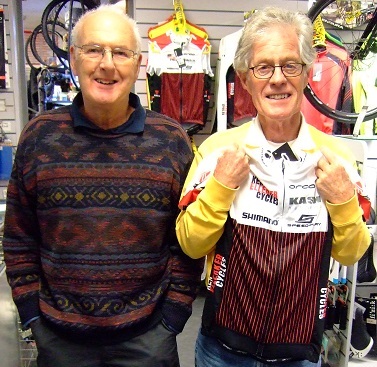 Established in 1954, we service the needs of Hull and East Yorkshire's cycling community. An extensive range of equipment is complemented by a wealth of knowledge and a range of services to help you gain the maximum benefit and enjoyment from cycling. We aim to be friendly and approachable, so please don't be afraid to come and seek advice. We stock a large selection of accessories and equipment to cater for all the popular cycling disciplines - road, cross country, touring, triathlon, fitness and commuting. Our showroom houses the best brands in cycling, and a well equipped workshop takes care of all of your servicing needs. We endeavour to stock a good range of clothing and accessories for men and women. This includes Trek's excellent range of women specific bikes, many denoted by the acronym WSD. Please note that our website gives a good representation of our stock, though it is by no means exhaustive. If you're after a special little something, please do enquire as we have access to many more products than shown here. If you are unable to visit us in person, or wish to reserve an item through click and collect, our website enables you to buy online. You can find information about ordering online, including delivery costs, by adding an item to the shopping basket and then finding the terms and conditions link on the shopping basket page. Carried out to the highest standards. Our experienced Cytech qualified mechanics have been able to fix problems that other bike shops couldn't. All makes and models accepted. See Workshop for further details. Suitable for all riders, Lee and Steve use the Precision Fit system to makes a thorough assessment of how you can achieve optimum comfort and performance. Unlike many bike fits Precision Fit is holistic and personalised, as it considers all aspects of the rider as well as the bike. A typical bike fit session is three hours long, so please contact us to book an appointment. See Bike Fit for more information. You are welcome to try out any bike before you buy (provided the bike is available and serviced, and subject to weather conditions). Verve+ and Verve+ Lowstep - electric hybrid bikes for men and women designed for comfort on commutes, daily cruises and recreational rides. Remedy 8 27.5 - a long-travel full suspension all-mountain bike that allows you to push harder, descend faster and have more fun! Powerfly 7 - an electric mountain bike that's equally suited to commuting, recreation and a ridiculously fun time on the trails. Please note that we also have access to Trek's fleet of road and mountain demo bikes, so don't hesitate to ask there's something you would like to try. Avant M20TEAM-D - carbon endurance road bike in custom MyO colours. Orca Aero M20 TEAM-D - carbon aero road bike. We also have demo Look Keo Blade pedals. Please ask. You can find our address, a map, and how to contact us on our contact page. 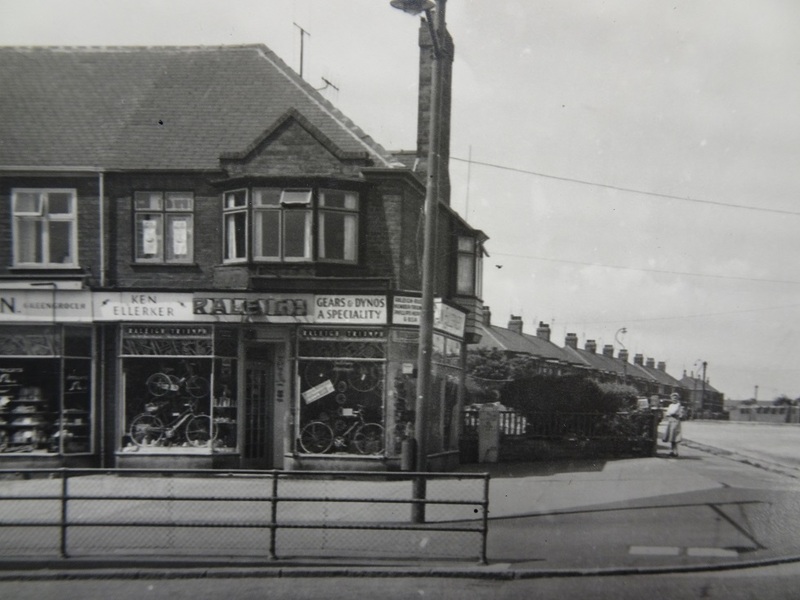 Arthur Kenneth Ellerker purchased 275-277 Chanterlands Avenue on 19th December 1953 for the sum of £1950 from Mallory's (1948) Ltd. Mallory’s hardware shop was transformed and reopened as Ken Ellerker Cycles early in 1954. 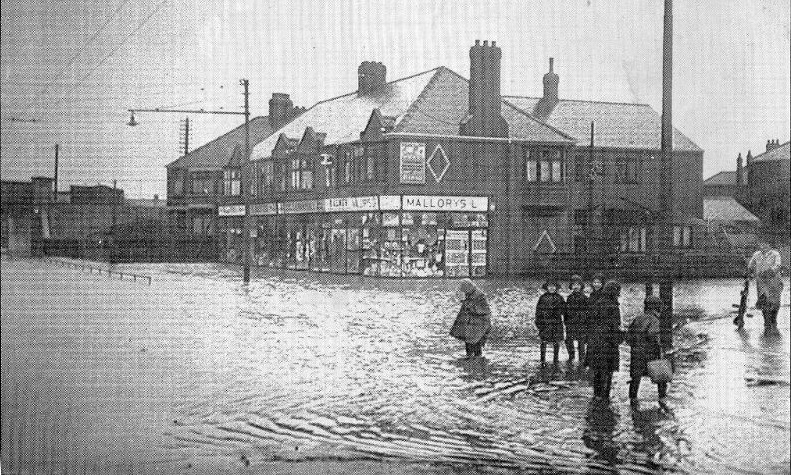 Mallory's hardware shop c.1950. There was similar flooding in June 2007. Ken outside the shop, 1956. 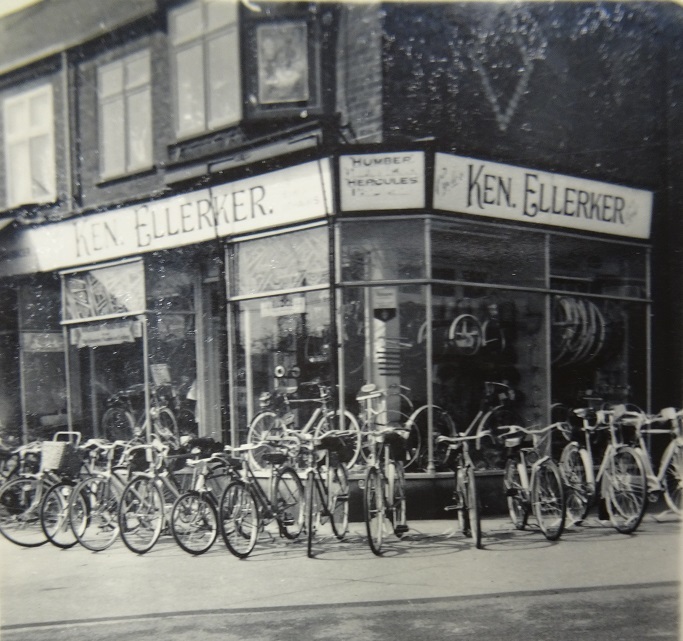 Ken Ellerker Cycles, 1956. Humber and Hercules are the brands advertised. A family business, and initially also the family home, Ken’s wife Muriel and son Brian helped out in the shop. 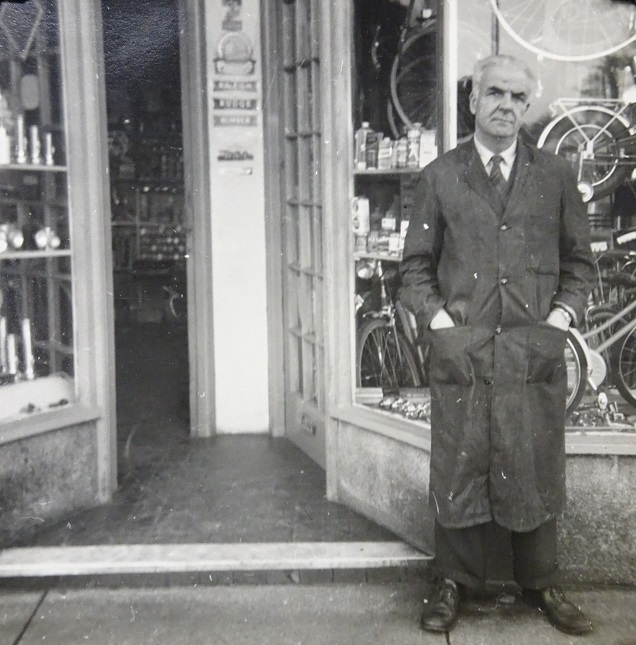 With a background in motor engineering Ken quickly gained a reputation for first class repairs, servicing and wheel building, standards we strive to maintain to this day. Ken’s first sale is reputed to be two bikes to the Eastburn family who lived in neighbouring Huntley Drive. The tradition at the time, apparently, was to frame the first £1 note received by a business for display on a wall. Sadly we don't have it anymore! Ken Ellerker Cycles, 1959. The changed signage now prominently features Raleigh. 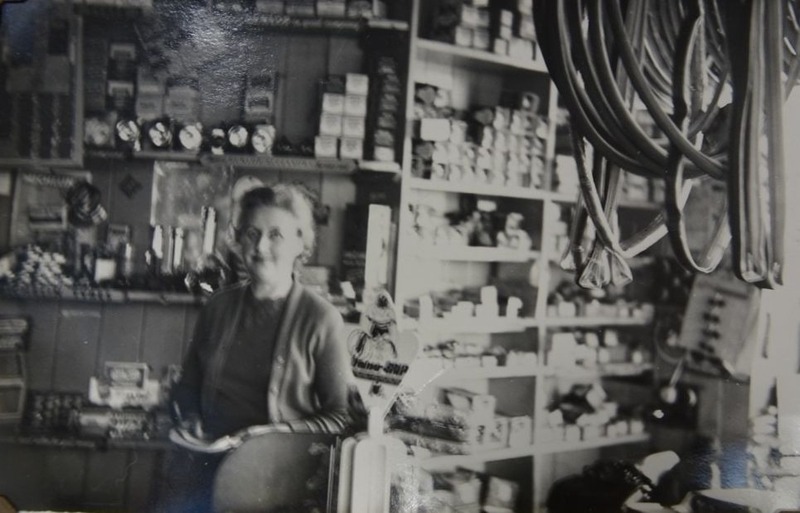 Muriel inside the shop, date unknown. After Ken’s death in 1962, the business continued to flourish under the stewardship of Muriel and subsequently Brian. With Brian now taking a lower profile in the shop, the day to day running has passed to the hands of John, the third generation Ellerker, in conjunction with staff members Lee, Steve and Doug. Among the many members of staff to work for Ken, Muriel and Brian are Pete Dunn and Eric Brumhead. A special mention also to our erstwhile colleague Daren Smith who became part of the furniture over the course of his 30 years of service. We wish him all the best in his recovery from the stroke suffered in January 2017. 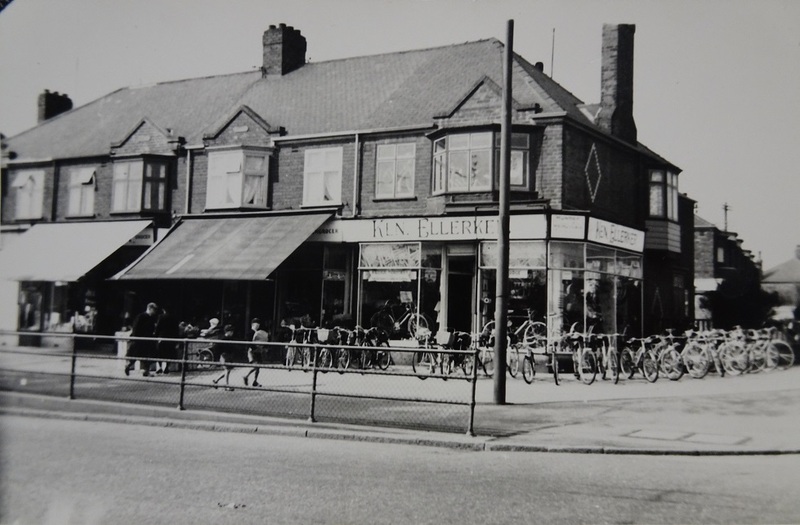 Bike brands stocked through the years have included Humber, Raleigh, Viking, Viscount and Coventry Eagle. The decline of many of these British companies was reflected by the appearance of brands such as Giant, GT, Scott, Specialized and Trek. 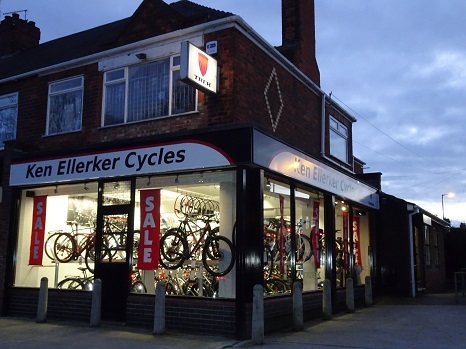 Ken Ellerker Cycles was one of the first retailers to showcase Trek bikes in the UK in the early 1990s. Trek’s high quality, innovative bikes continue to be popular with our customers today. More recently Orbea - a company with a history even longer than our own, having been established in 1840 - Electra and Orro bikes have been welcomed into the range. Brian Ellerker is the owner of the business and has worked from the ripe old age of 17. His youthful looks disguise the hard work that he has dedicated to training his staff to give the best service possible, sharing his experience and teaching us all there is to know about cycling. Lee Smith has a long history in cycling. He can be found touring Yorkshire's country lanes on his cross bike, or pounding up and down the hills on his mountain bike, both with a smile on his face and joy in his heart! Lee has a deep passion for all things cycling. Proof of this comes from his vast bicycle collection (pretty much all in matte black!). Bordering on "geek" status, he has an extensive knowledge whether it be mountain, road or cross or even eBikes, and has worked in the industry for over fifteen years. Achieving Cytech Level 2 mechanics, and a trained Precision Fit bike fitter and Bosch eBike Technician, has further extended Lee's knowledge and ability in all things biking. Steve Kilgour benefits from his experience in engineering, and is our go-to guy for mechanical problem solving. He's a very keen cyclist, finding time away from his busy family life for cross and road riding. He is one of our expert mechanics, is qualified as a Shimano Service Technician, Bosch eBike Technician and has reached PhD level at Trek University. Steve has also completed Precision Fit Level 1, so now also has expertise in bike fitting. John Ellerker is the son of the boss and therefore the only one who can attempt to tell his dad what to do! He has a number of thankless tasks, including admin and keeping the website updated! As for his cycling experience, there isn't anywhere this boy goes without a bike, be it to Sainsbury's for the Sunday roast or scaling the dizzy heights of the Col du Tourmalet. Doug McCarthy is our friendly young face, eager to help as you come into the store. He has completed Cytech Level 2 training and reached PhD Level at Trek University. Doug is an eager cyclist and rides everyday. Whether it be on his road, cross or mountain bike, you'll see him out there somewhere! Shirley Tait is our latest recruit. A committee member of Sunday Girls Road Club and a Breeze ride leader, Shirley will be delighted to help you on alternate Saturdays.